The Marvel Cinematic Universe has been on a serious roll in Phase Three, as every single blockbuster has been a critical and box office success. The last decade of filmmaking will come to a head when Avengers: Endgame arrives next month, before Marvel Studios begins working on the next slate of films. Phase Four (if that’s what it will be called) will begin with Spider-Man: Far From Home, but the MCU after that sequel is a complete mystery. One of the biggest questions looming around the future of the MCU is the state of Guardians of the Galaxy Vol. 3. James Gunn was fired by Disney in July, resulting in the project being put on indefinite hold. But now the director/writer has been brought back to finish his trilogy of movies. Although considering Gunn’s involvement in The Suicide Squad for DC, it wasn’t clear when filming will begin for Guardians 3. But now we may have an idea. According to Production Weekly (via Comic Book), Guardians of the Galaxy Vol. 3 will begin production in February of 2021. The film was originally set to follow Spider-Man: Far From Home, although now it looks like we’ll have to wait a number of years before the motley crew of heroes finally arrive in theaters. Still, it’s exciting to see that the project is back in active development. With Guardians of the Galaxy Vol. 3 reportedly going into production years from now, one thing is clear: Marvel fans will have to go a number of years without seeing the Guardians on the silver screen. Filming for Marvel movies is usually extensive, as is the editing and post-production process. So it wouldn’t seem out of the question for the upcoming threequel to arrive in 2022. Fans should enjoy their role in Avengers: Endgame, because it’s going to be a while before they return to theaters. Of course, the report by Production Weekly hasn’t been officially confirmed by Marvel Studios, so it’s certainly possible that things will turn out differently. But given how James Gunn was only just reinstated for Guardians 3, the movie can’t jump right into production. Gunn will reportedly focus on The Suicide Squad for Warner Bros. first, which may explain the years gap before filming for the Guardians theequel begins. He’ll also have to complete his draft of the Guardians 3 script, which was finished around the time of his departure. Now that Guardians of the Galaxy Vol. 3 is officially happening with James Gunn behind the camera, the most obvious question is exactly how the titular team of heroes will unite, given the events of Avengers: Infinity War. The Guardians were hit hard by Thanos’ assault on the galaxy, starting with Gamora being killed so he could acquire the Soul Stone. And when Thanos snapped his fingers, audiences were left to watch as Mantis, Drax, Star-Lord and Groot faded to dust before our eyes. 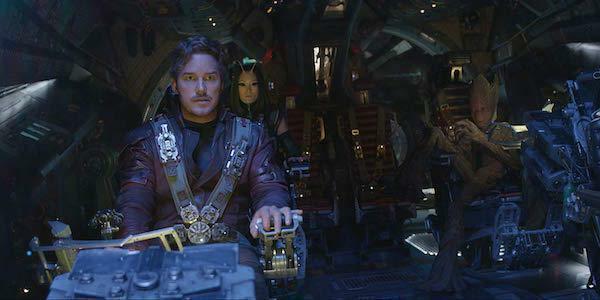 Rocket and Nebula are the only characters left, and will be joining The Avengers for their mysterious mission to fight Thanos in Endgame. Hopefully they’ll reverse the affects of the snap, and somehow bring Gamora back to life as well. Previous ArticleDaddy Yankee Makes History On Corden With Exhilarating ‘Con Calma’ PerformanceNext ArticleWhat’s The Deal With Peggy Carter In Avengers: Endgame?